helping Haiti -- from the charity: water offices, Monday from charity: water on Vimeo. charity:water offices were transformed into a drop off location for needed items in Haiti. Although they stopped accepting donations of items at 5:00 PM (because the plane leaves on Tuesday), I thought this video is one small example of different grassroots efforts underway to help. These supplies will be transported by Partners in Health to where they are needed most. Other charity:water partners in Haiti, Concern Worldwide US, are sending supplies from Ireland and still have a pressing need for donations. charity:water is encouraging online donations to their partners who are in Haiti and working to quickly to deliver disaster relief services. Partners in Health and Concern Worldwide, US. Joanne Fritz of Joanne Fritz's Nonprofit Blog has a helpful post with Top Three Do's and Don'ts for Helping Haiti. Her advice is: 1. give money, not things; 2. donate safely; 3. don't randomly show up to volunteer. This is a call to action or call to sing. Amy Carol Wolff, a musician, wrote a song this summer and now she is hoping that people will use it for benefit concerts. More here. The Red Cross text HAITI to 90999 campaign continues to break records in SMS giving in the US. 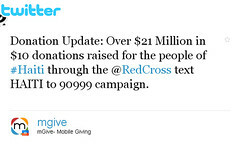 As of a couple of hours ago, the Red Cross Twitter account retweeted the above from mgive it has raised $21 million in $10 donations. MobileActive has a detailed report on the fundraising via sms. We're also seeing more embedded giving opportunities to give to disaster relief efforts. This one comes from Causeworld, an iPhone app that allows users to leverage donations from corporate sponsors by spreading good karma. They are doubling donations to the Red Cross disaster relief effort. You can now Donate Money to the Haiti Hospital by clicking the linke below. Target £1,000. So if everyone donates £1, and we get 1000 members, were sorted, so log on, dig deep and invite members!! Thanks for the shout out, Beth! Thanks for putting up your efforts, not many people are4 actually paying heed to what the world is going towards !